Whether internally with co-workers or externally with our customers and partners, delivering WOW results in word of mouth. Our philosophy at Zappos is to WOW with service and experience, not with anything that relates directly to monetary compensation (for example, we don't offer blanket discounts or promotions to customers). We seek to WOW our customers, our co-workers, our vendors, our partners, and in the long run, our investors. At Zappos, we’re always creating fun and a little weirdness! One of the things that makes Zappos different from a lot of other companies is that we value being fun and being a little weird. We don't want to become one of those big companies that feels corporate and boring. We want to be able to laugh at ourselves. We look for both fun and humor in our daily work. At Zappos, we think it's important for people and the company as a whole to be bold and daring (but not reckless). At Zappos, we think it's important for employees to grow both personally and professionally. If you've been at Zappos for more than a few months, then one thing is clear: Zappos is growing. We grow because we take on new challenges, and we face even more new challenges because we're growing. It's an endless cycle, and it's a good thing: it's the only way for a company to survive. But it can also feel risky, stressful, and confusing at times. Yet no matter how much better we get, we'll always have hard work to do, we'll never be done, and we'll never "get it right." That may seem negative, but it's not: we'll do our best to "get it right," and then do it again when we find out that things have changed. That is the cycle of growth, and like it or not, that cycle won't stop. It may seem sometimes like we don't know what we're doing. And it's true: we don't. That's a bit scary, but you can take comfort in knowing that nobody else knows how to do what we're doing either. If they did, then they'd be the web's most popular shoe store. Sure, people have done parts of what we do before, but what we've learned over the years at Zappos is that the devil is in the details. And that's where we're breaking new ground. Strong, positive relationships that are open and honest are a big part of what differentiates Zappos from most other companies. Strong relationships allow us to accomplish much more than we would be able to otherwise. At Zappos, we embrace diversity in thoughts, opinions, and backgrounds. The more widespread and diverse your relationships are, the bigger the positive impact you can make on the company, and the more valuable you will be to the company. It is critical for relationship-building to have effective, open, and honest communication. At Zappos, we place a lot of emphasis on our culture because we are both a team and a family. We are inspired because we believe in what we are doing and where we are going. We don't take "no" or "that'll never work" for an answer because if we had, then Zappos would have never started in the first place. We believe that no matter what happens we should always be respectful of everyone. Take a virtual tour of our beautiful campus in Downtown Las Vegas. We've completely transformed the old city hall building into 276,500 square feet of fun, creativity and weirdness! We've got everything you can imagine: delicious bistro, coffee shop, yoga studio, nap room, gym, green-space backyard, rooftop deck, patio furniture, hammocks, ping pong, sand-floored beachy conference room, co-working space on the top floor with panoramic views and even touch screen video games in the elevators to make your ride up and down the 10 floors just a little more fun! 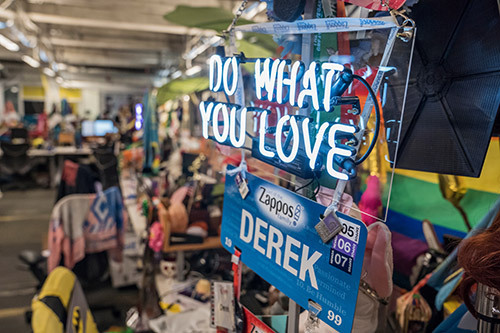 At Zappos, we give you the opportunity to move forward with new ideas that make the company better. In most companies, new ideas have to be approved by a manager, or a chain of managers. As a company who uses Holacracy, we encourage every employee to identify areas of opportunity within the organization, and use the Holacracy process to propose solutions. The Holacracy process is designed to prevent ideas from being “shut down”, and gives everyone an equal opportunity to speak in meetings. Most importantly, we encourage you to be yourself and have fun. We don’t promote work/life balance in the traditional sense, rather we believe in “work/life integration.” We like having a good time at work, not just outside of it. There’s no need to hide your random quirks or awkward dance moves from us. In a way, you might be taking a “break from life” by working here! Learn more about Holacracy here. Intertwined with restaurants, retail, and entrepreneurialism, our home in Downtown Las Vegas is utterly unique to the world. 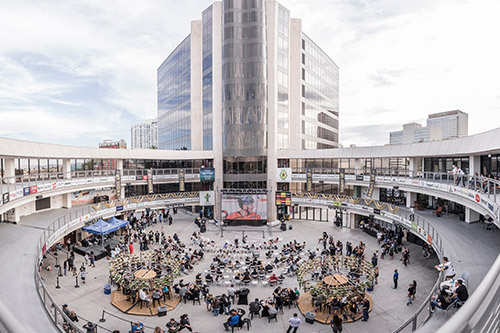 Tony Hsieh's Downtown Project is committed to helping to transform Downtown Las Vegas into the most community-focused large city in the world by inspiring and empowering people to follow their passions to create a vibrant, connected urban core. 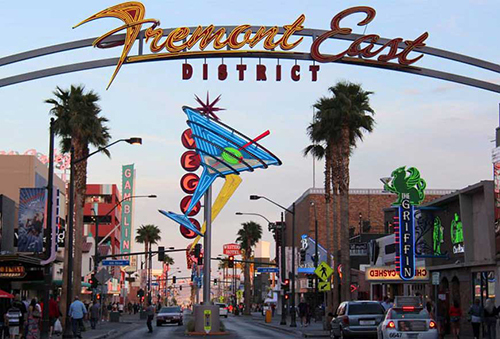 Cafes, bars, sidewalk bistros, small businesses, public spaces, co-working communities, a thriving entrepreneurship & tech scene, a focus on arts, music & culture… Downtown Las Vegas is where we work, live and play.